List Rules Vote up the spookiest Las Vegas stories. Sin City didn't just get its name from its reputation as the gambling capital of the world. The glittery lights and casinos of Las Vegas pale in comparison to some of the cities juiciest ghost stories. It's one of the most haunted places in the West, and - despite a very storied history - is home to some of Nevada's creepiest stories. From its earliest days, Las Vegas has played host to mobsters, disillusioned gamblers, washed up entertainers, broken-hearted starlets, and various eccentric types. Some of these have Las Vegas ghost stories associated with them, and the infamous strip is most definitely one of the more haunted places on Earth. While it might not be the cities most popular feature, haunted Las Vegas attractions are just as exciting as any show on the strip. If you like a scary tale or want to have encounters with Las Vegas ghosts, there are plenty to keep you company on your next visit. 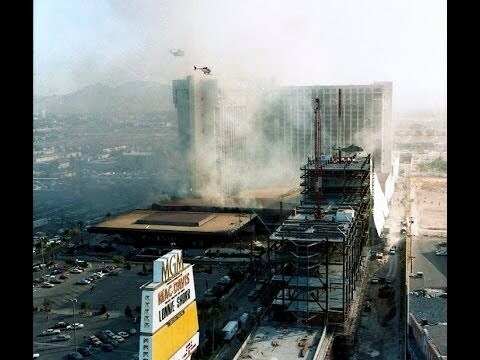 Las Vegas's Bally's Hotel has reported a number of strange, paranormal sightings and events since it opened in 1985. There are even reports of ghostly activity in the casino. The most common complaint hotel guests make is the presence of a smell of smoke and burning, especially on the upper floors, even if there's no one smoking. Others have described hearing wails and screams coming from the hotel's stairwell. Paranormal experts believe the smoke and the screams are coming from the ghosts of fire victims. Bally's stands on the site of the old MGM Grand Hotel, which burned in 1980. Eighty-five people died in the fire, most due to smoke inhalation. Perhaps their tormented spirits still writhe in fear and pain. Down in the casino at Bally's, there is another ghost - that of an old woman. Those who claim to seen her say she's holding a cigarette while playing two slot machines at once. Some say if you look closely, her dress is on fire. Whenever someone approaches this apparition, she disappears. Up on the 17th floor of Bally's is still another ghost: that of a young boy, whose voice can be heard crying out for his mother. He cries, and then coughs, and is then silent. Some say he was a little boy who was separated from his mother during the old MGM fire. The Tropicana Hotel and Casino's main claim to ghostly fame has to do with a hand-carved tiki mask that is displayed in the hotel lobby. The entire hotel is considered to be haunted, but much of the paranormal activity seems to be somehow connected to the tiki mask. Some guests have described it as having an evil, creepy presence, and it's become popular for tourists to have their photos taken posed next to the mask. Some daring individuals even go so far as to touch the mask. Some say it is very bad luck to come into physical contact with the mask, as it will lead to developing a strange purple rash. Some have said that their photos with the mask show a purple mist that distorts the mask's appearance. One of the most often told ghost stories about the Tropicana has to do with a woman who was spending an extra night alone at the hotel after her two friends left her a day early. The woman was very tired that evening, but could not get to sleep. She claimed to have a feeling that someone was watching her. Finally, she fell asleep, but was awakened in the night when she sensed a presence with her in the room. A man was standing right next to her, but he was facing the wall with his back to the bed. The woman was terrified, and screamed at the loathsome figure, which slowly turned to face her. She reached for the lamp switch and as soon as light filled the room, the man had disappeared. Later, the woman complained to the front desk at the hotel, and was given a free extra night's stay, in the same room. She politely declined. Located just off the strip is a place called La Palazza Mansion. Said to be a former mob house, visitors to the now-abandoned site report an evil vibration coming from the structure, with one calling it "Satan's mansion." One of the mansion's former owners is said to have directly confronted a demonic entity with a sword. As he did this, he began to feel icy fingers clutch firmly around his neck. One of the owner's friends had to grab him and pull him outside to stop the choking sensation. There are apparently a number of secret rooms in the mansion, too. During the remodeling of one of the rooms and its adjacent bathroom, numerous bloodstains appeared, suggesting that a murder had taken place there. The owner's girlfriend claimed the evil spirits that pervaded the mansion whispered sexually suggestive comments in her ear, especially when she was in the shower. The many-turreted Excalibur Hotel draws a crowd with its medieval spirit and vibe. But there are other sorts of spirits lurking there; specifically on the 10th floor. People who have stayed on the 10th floor report a variety of strange, paranormal activities. Rooms become suddenly chilly, and even corridors have cold spots. Other guests report the sensation of someone following them and even breathing on their neck or into their ear. Visitors also claim to see furniture moving about on its own, and hear static from televisions that are not turned on. Phone calls with no one answering on the other end are reported, and alarm clocks that were never set suddenly go off at all hours of the day and night. Should you book a room at the Excalibur, you might want to ask for any floor but the haunted 10th.